In his remarks introducing three donors who met the people whose lives they saved, Howard Milstein looked back at the progress of treating cancers with bone marrow transplants and paid tribute to the bravery of the women and men of the FDNY. “As Chairman of the New York Blood Center and as a supporter of medical causes throughout the world, I have seen how the miracles of science help save lives,” Milstein said. “I have seen boys and girls, men and women, cured of diseases that were death sentences when I was growing up. It was unheard of for someone to survive a disease like leukemia and lymphoma 50 years ago. Today, we are seeing cure rates of up to 90 percent for some cases of leukemia and lymphoma among children, and the statistics continue to improve. At the age of 16, Ms. Rugh was diagnosed with a very aggressive form of Hodgkin’s lymphoma. She underwent chemotherapy, radiation treatments and a self-transplant of bone marrow. Firefighter Chiz joined the Department in 2007 and signed up for the National Bone Marrow Registry with his classmates while training at the Academy. A few months later, he was contacted as a possible match for someone, and after much testing, he was confirmed as the best possible match. The Firefighter’s parents, Bob and Mary Chiz, said it did not surprise them that their son would step up to help. “He’s very caring, willing to do anything to help anyone,” Mr. Chiz said, noting he was especially proud of his son because his good friend Firefighter Terry Farrell, who died at the World Trade Center, was also a bone marrow donor who spoke often about the importance of the program. 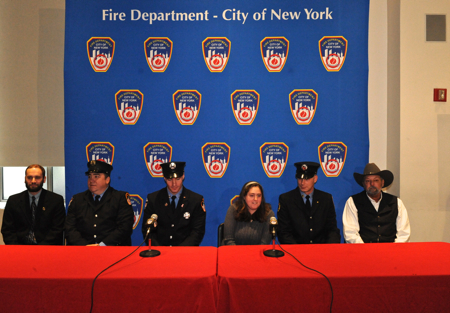 In 2008, Ms. Rugh received the bone marrow transplant from Firefighter Chiz that would save her life. She needed a second transplant in 2011 and Firefighter Chiz was again chosen to be the donor, not realizing it was for the same recipient. Today, Ms. Rugh is a junior at the University of Pittsburgh, majoring in psychology. 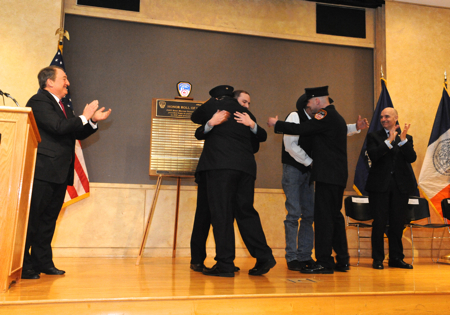 “I never thought I would get to meet my donor,” Ms. Rugh said, adding that she did not know it was a firefighter who donated until a few days prior to the ceremony.